Reel is core device for recoiling machine and uncoiler, which is direct operating part of recoiling machine and uncoiler. The mandrel is the key part of hot rolling tension reel for coils. Coiling temperature is between 550 to 850 oC . The mandrel has mainly two types: link wedge type and double wedge type. Unk wedge type can also be divided into two kinds: link wedge coupling drive and link wedge-spline drIve. For link wedge-coupling type tension reel, the mandrel is mainly composed of rnandrel body, spreader bar, segment, link, wedge and spreading cylinder Spreader bar has multistage slopes and segment is supported by multistage wedge Segment is connected with spreader bar by link so segment does not drop off With compression spring in the middle of wedge, wedge can firmly contact segment and pyramid surface. There is a gap between the upper surface of wedge and segment, which can reduce the impact of coil head to mandrel during coiling coil. Mandrel body is installed on two bearings. Power is transmitted by crowned-teeth coupling in the rear. It is very convenient to dismantle, and due to there is no gear impact during working. mandrel rigidity is improved. lt’ s very beneficial to control the dynamic tension. The spreadding principle of mandrel: spreader bar moves inside mandrel body in axial direction driven by hydraulic cylinder, the slant of spreader bar pushes the wedge inside radial hole of mandrel body to move outward The wedge upper surface pushes segment to expand outward Wedge diameter will expand After coiling coils, preader bar moves in the opposite direction driven by hydraulic cylinder, and pulls segment inward to shrink through link Wedge moves inward and mandrel diameter becomes smaller to discharge state Then you can begin to discharge coil. For the two types of link wedge-coupling drive and link wedge-spline drive, the mandrel structures and principles are same and the main difference is drive type of mandrel. 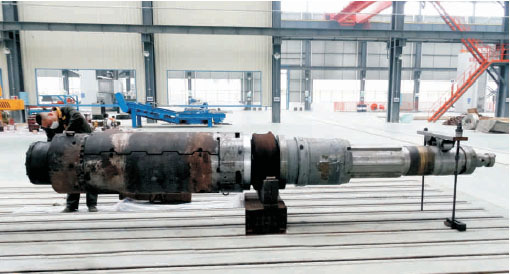 For link wedge-spline drive type, connection between mandrel and main transmission case is spline, i.e. insert type. When mounting and dismanting, mandrel can be directly insert or pull out of the main transmission case to achieve the rapid replacement. The main driving motor dives gear shaft rotation through the intermediate shaft. The gear shaft drives big gear rotation, and the big gear drives mandrel rotation through spline. For double wedge type tension reel, the mandrel is mainly composed of mandrel body, spreader bar, segment, spreader wedge, buffer wedge and hyd, cylinder. 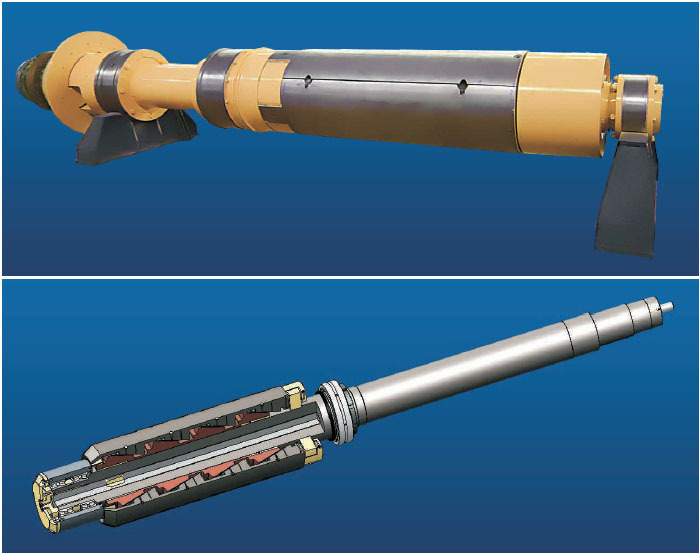 The spreading principle of double wedge type mandrel: hyd.Cylinder makes spreader bar move and forth in axial direction and the wedge move in radial direction. So the segment become big. T-hook on spreader bar pulls wedge back and the hook outside the wedge pulls segment back. This will make the mandrel small. 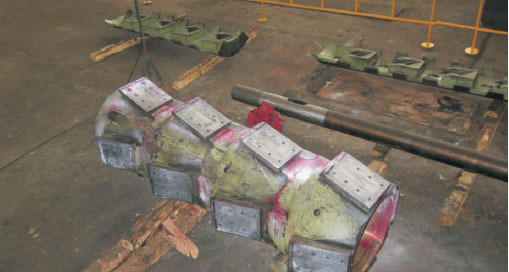 With spline connection for power transmission unit, mandrel can be rapidly replaced. Cooling water channel is inside the mandrel, so cooling effect is good. Lubricant can be injected by auto and manual tye, so is can reduce parts wear. Pay-off reel and tension reel for cold rolling coils are used in cold rolling production line or pay-off when acid picking, galvanization, annealing, shear, coating or coil tension in outlet. Cold rolling mandrel is the key parts of pay-off reel & tension reel. According to different structure, it has beam wedge type, pyramid axis type, pyramid sleeve type, wedge type, radial direction hyd. cylinder type, etc. Or simply, open type and close type. The close type mandrel is a close circle without gap in the surface after expanding. It is suitable for coiling thin strip steel. The open type mandrel means there are a gap between segments after mandrel expanding, suitable for coiling thicker strip steel. 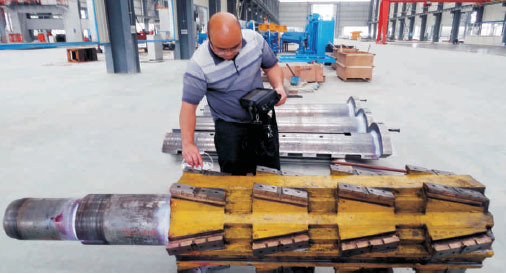 The beam wedge type mandrel is mainly composed of the main shaft, expanding core, segment, axial direction wedge, radial direction wedge and spreading cylinder, etc. There are two kinds of structure; with jaw or without jaw. The mandrel with jaw is used for coiling thicker strip steel. It can also be set with steel sleeve or paper sleeve to coil with belt wrapper. 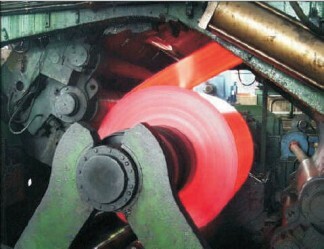 The mandrel without jaw is used for coiling thin strip steel by belt wrapper. The mandrel will move along axial direction driven by the expanding core & wedge block, through relative sliding between the wedge block and segment, swelling and shrinking will occur in radial direction, reset by spring. The pyramidal axis type mandrel is divided into taper type and back taper type according to the tilting direction of axis slope. 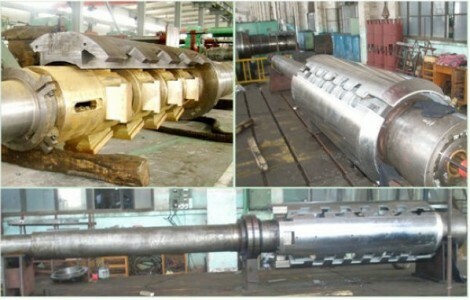 This mandrel has simple structure, less parts, large main shaft, large main shaft section and high strength. So it can bear large tension, not only coiling, but also uncoiling. There are two kinds of structure: with jaw & without jaw. It is mainly consisted of the pyramid axis, segment, hollow sleeve and spreading cylinder, etc. At present, the back taper type mandrel is most popular. The oil goes into the cylinder through a rod cavity. The cylinder pulls the pyramidal shaft backward along axial direction and push segment to expand outside, so the drum is expanded. Pyramidal axis moves backward along axial direction, and segment is pulled back by the T key, thus the mandrel is shrinked. The pyramidal sleeve mandrel is mainly composed of the main shaft, pyramidal sleeve, spreading core, segment and spreading cylinder and so on. It is the most common structure. Because of its simple structure, good strength and rigidity, it is widely used in various units, its internal structure is diverse. For the wedge tension reel, mandrel is mainly composed of the main shaft, wedge, spreading core, segment and spreading cylinder and so on. It is also a common structure. When spreading core drives the wedge, the mandrel moves along axial direction of the main shaft. Through relative sliding between the wedge block and segment, it makes mandrel diameter swelling and shrinking, to reset the segment by wedge hook.